The ministry of Jesus in the Gospels starts with the wedding at Cana. Mary approaches Jesus because she sees that the family is going to be embarrassed when they run out of wine. She intercedes, so to speak, on behalf of her friends. Perhaps Jesus can do something about this. The response of Jesus is not disrespectful. Jesus could not be disrespectful to his mother, that would have been an offense against the God’s law. We know that Jesus fulfilled the law perfectly because in Him no sin was found. What is then the meaning of his response? John renders that word in the Greek as gunai which is similar to the classic use of the word “my lady”. The International Standard Version translates this phrase as follows: “How does that concern us, dear lady? My time hasn’t come yet.” The phrase in the original was not disrespectful at all. Perhaps Jesus was not inclined to show himself in such a public venue as someone able to perform miracles. Yet Mary prompts him to help and he agrees to solve the problem. At the same time he calls Mary “My Lady” the title that many generations of believers will use to identify Mary. The term gunai was used by God in Genesis when He condemned the Serpent, He said “I will put enmity between you and the woman (gunai)”. When Jesus addresses Mary in that way, he is revealing to us her coming role in the history of salvation. She is the gunai whose seed is going to defeat the seed of the “original serpent,” Satan the Devil (Revelation 20, 2). In Genesis 3, 15 we see how rapidly God announces the redemption of the human race, as soon as Adam and Eve fall. The foolish offense of Adam requires a satisfaction or redemption that sinful mankind cannot provide. God will provide a “new Adam” (1 Corinthians 15, 21-22; Genesis 22,8) a perfect man to accomplish the redemption of humankind. God will also provide a “new Eve” the “lady” or “gunai” who is going to transmit life to her children instead of death. Her seed or descendants will not be deceived by the serpent but crush its head instead. 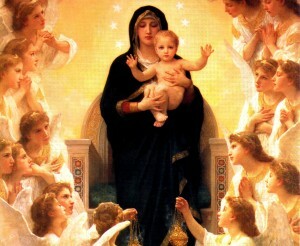 That woman, mysteriously hidden in God’s purpose from the times of Genesis is the Virgin Mary, Our Blessed Mother. She is the perfect opposite of the original Eve, just as Jesus is the perfect opposite of the original Adam. Eve gave the fruit of the forbidden tree to her husband to eat, thus passing death to all their descendants. Mary, Our Blessed Mother gives us life through her son Jesus, the fruit of her womb, the one destined to redeem mankind by hanging on the Cross.